367 results. Displaying results 61 - 80. Miniature silver oar in a leather case. Presented by the Ladies of Tonbridge for the TBC Challenge Pairs "Stroke", to JF Hall for 1883-1887. Hallmarked as made of Birmingham silver in 1883, by G & A Cornell of Tonbridge. 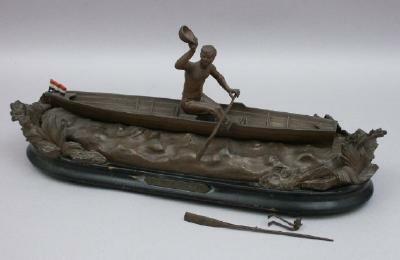 Cast metal trophy of rower seated in a skiff, with right arm aloft holding a cap. Plaque on the side of the base is engraved "Un Premier Prix". Associated with Leiden Rowing Club. Photograph of Amy Gentry, dated 1935, posing for a bronze statuette that was produced for the trophy for the Gentry Challenge for senior sculls in the Women's ARA Regatta, presented by CO Gentry Esq (Amy Gentry's father). 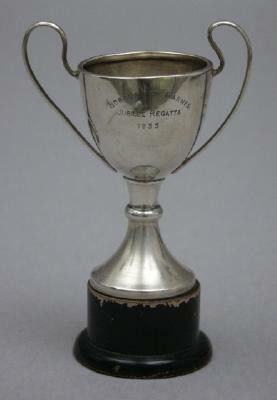 Miniature silver cup won by Amy Gentry who rowed for Weybridge Ladies Amateur Rowing Club in the early 20th century. Borough of Barnes Jubilee Regatta silver plated miniature cup awarded to Amy Gentry in 1935. Pangbourne and Whitchurch Regatta- The Trentham Challenge Trophy 1965. Silver plated cup with a handle either side, on a black plastic base. The handles are decorated with scrollwork. Engraved inscription on front. West End Amateur Rowing Association Regatta 1933. Silver bowl comemorating the Herbert Marshall Pairs which was won by JWR Baker. Made by Mappin & Webb. 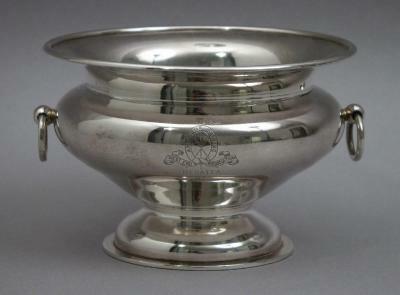 Silver plated bowl with two looped handles, a large lip and a small foot at the bottom. WEARA logo on one side and the winner details inscribed on the other side. 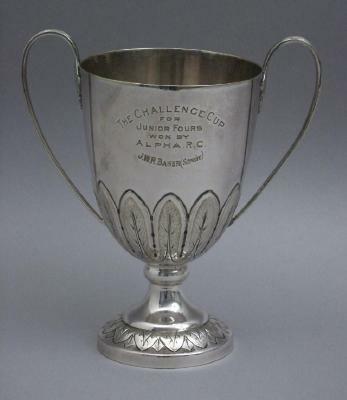 The Challenge Cup for Junior Fours, won by Alpha RC (with JWR Baker as stroke), West End Amateur Rowing Association Regatta in 1929. 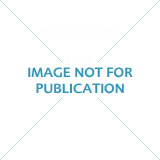 This cup can be seen in the photograph HENRM 2001.287.1. 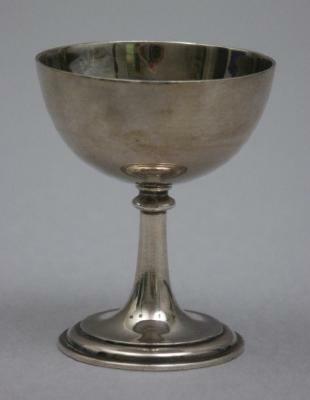 Tall silver two handled silver cup with a decorated base and a leaf pattern at the bottom of the cup. Inscribed one side and on the other side is the WEARA logo. Makers mark on the bottom. 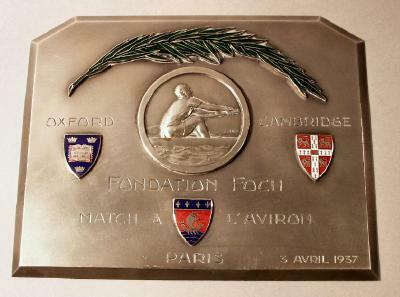 A pewter plaque awarded at the Oxford Cambridge Foundation Foch in Paris on the 3rd April 1937. Inscribed on the front: "Oxford Cambridge Foundation Foch Match L'Aviron Paris 3 Avril 1937" Inscribed on the reverse: "Sous le patronage du journal. 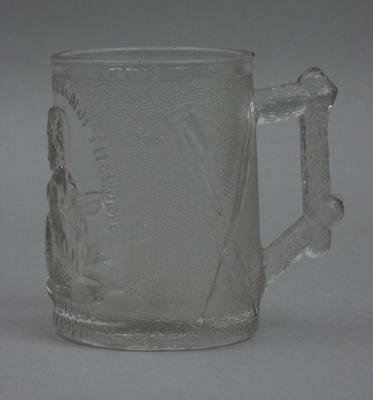 Le journal et de radio Luxembourg"
A glass tankard commemorating Edward Hanlan's victory over Trickett, of N.S.W, to become the World Sculling Champion on the 15th November 1880. Pressed glass produced by Davidsons.